Troughton!!! Yes, I've finally gotten around to the Second Doctor. He is among my favorite Doctors (list and careful examination to come out in November). The Second Doctor is commonly referred to as the 'cosmic hobo.' He is a fantastic Doctor that not many know about because the BBC foolishly trashed most of his episodes during the seventies, leaving very few complete. This is a story straight out of the hardest hit section. The only complete serial featuring the companion that's featured here is The Tomb of the Cybermen (which is a fantastic episode). The Tardis lands in a control room in the future. As the Doctor, Victoria and Jamie are chewed out by the security officer, an emergency call comes through. It warns of a lightning storm and cuts out. The power has shut off a space station above. 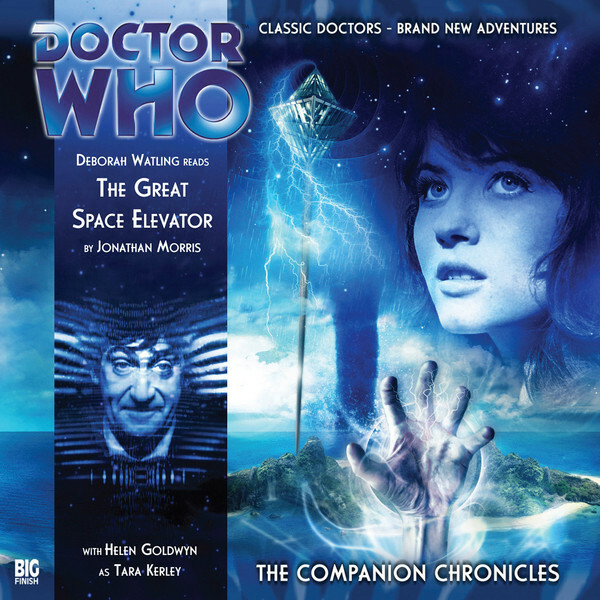 Then, the Doctor, Victoria, Jamie, and the Security Officer Tara head up the great space elevator to investigate. This audio really captures the wonder of traveling with the Doctor. Victoria is amazed at the view of the earth from the elevator and the station as well as the massive tower itself. This story is based on a scientific principle (the left hand rule) and it manages to be entertaining. Victoria Waterfield is a Victorian girl who sees the Doctor as a father figure. She has a very romantic outlook on the world and that sometimes conflicts with the life that the Doctor leads. She's curious and takes a lot of riskier actions because she doesn't like Jamie and the Doctor's protectiveness. The Second Doctor acts like a clown to cover up his intelligence. This story has all the hallmarks of this era and Debra Watling does a decent impersonation. I think the Second Doctor is too on top of his game here. Though, the characters never felt in peril, but it is great to hear them. Jamie McCrimmon is a Scottish Highlander who is fiercely protective of both the Doctor and Victoria. His ignorant blunders even end up helping to save the day. He even tries to peek at Victoria as she changes clothes. Security Officer Tara is on the job and tries to do an official investigation. She's fiery, but not overly hostile to the Doctor and his companions. She acts as an essential authority that allows the group to undertake their adventure. The Monster is an interesting force that isn't out to harm anyone, but will due to its need to feed. It is frightening in its power, but doesn't come off as scary or creepy. Space elevators are cool! I loved the elevator ride and the observations of Earth and the space station. Sadly, inside both the bases it returns to sixties 'futuristic' console rooms and corridors. These were quite evocative of the era, but it did leave me a bit sad after the awesome space elevator ride. The end involves the Doctor saving the world with a clever ruse, surprise! Okay, there is a bit more than that, but it was pretty standard. This is Jonathan Morris' first audio work. I have really grown to look forward to his stuff. Despite the fact that this is not his best, I enjoyed it. The glory of the setting and the simple scientific nature of the plot allow for the story to flow without having to explain itself too much. This is an awesome look at one of Doctor Who's greatest eras and I would recommend it to any fan of the show.